Thank you for your interest in scheduling an appointment at our office. We are sure that you will be satisfied with the care you receive. 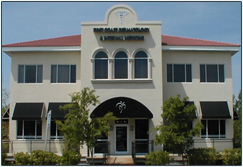 At the present time, all four providers are accepting new patients. Please contact us via email or at (904) 249-6110 Monday through Friday between the hours of 8:00am to 5:00pm and we will be happy to assist you. If contacting us by email, please indicate which provider you would like the appointment for, dates and times that you are available, and the reason for the visit. Our email is not secure, so please refrain from including any information that is sensitive in nature. If your request is urgent, please contact us by phone. If you are a new patient, we ask that you arrive 10 minutes prior to your appointment time so that we may complete our portion of the new patient paperwork, as well as to help ensure that all is kept on schedule. Please make sure that you have completed the registration forms prior to your arrival. 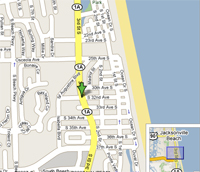 We are conveniently located on 3rd Street South (A1A) in Jacksonville Beach - ½ mile north of Butler Blvd. (FL 202) or 1 ½ miles south of Beach Blvd. at the corner of 32nd Ave. South. The parking and office entrance are located in the back of the building.